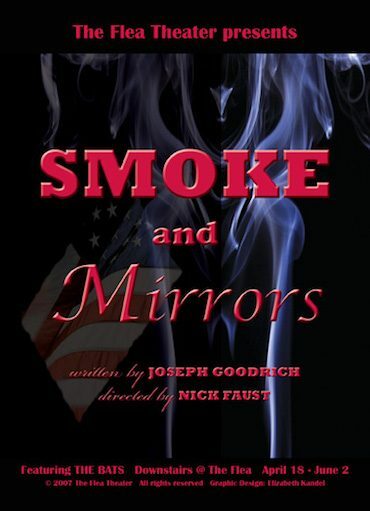 The Flea Theater presents the World Premiere of Smoke and Mirrors by Joseph Goodrich beginning April 18th. The production is directed by Nick Faust and stars The Bats, the resident acting company of The Flea. Opening night is slated for April 27th. Smoke and Mirrors stars Ben Horner, Susan Hyon, Jason Dirden, Jocelyn Kuritsky, Aurelia Lavizzo, Parrish Hurley, and Stas May with sets by Neal Wilkinson, lighting by Joshua Higgason, costumes by Elizabeth R. Payne, and sound by Brandon Wolcott. Joseph Goodrich is a writer and actor from Minnesota. His plays have been produced in New York City, Los Angeles, San Francisco, New Orleans, Minneapolis/St.Paul, Chicago, and Portland. White Russianis included in The Backstage Book of New Short American Plays 2004. Steak Knife Bacchae is included in Padua: Plays from the Padua Hills Playwrights Festival (distributed by TCG). Playscripts, Inc publishes another five of his plays. His poetry has appeared in the Venice West Review, his fiction in “Bullet” magazine, and he is a contributor to Conducting a Life: Reflections of the Theatre of Maria Irene Fornes. He is a member of New Dramatists and the Mystery Writers of America. Director Nick Faust is a regulator collaborator of Goodrich’s, and has helmed his plays in cities across the U.S., including New Orleans, Portland and Los Angeles. Faust spent many years directing at the Milwaukee Rep, the Lyceum Theatre of Arrow Rock, Missouri, and the Climb Children’s Theatre of St. Paul, Minnesota. Most recently he directed Goodrich’s An Opening for Murder at the Evansville Museum in Indiana. Smoke and Mirrors runs April 18 – May 26, performance schedule varies.